I love this compact model. 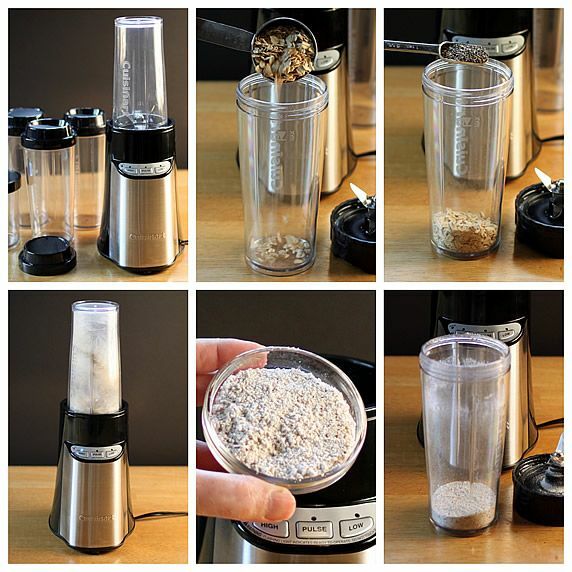 It's perfect for smoothies and other small blending tasks. The multiple containers are so handy! 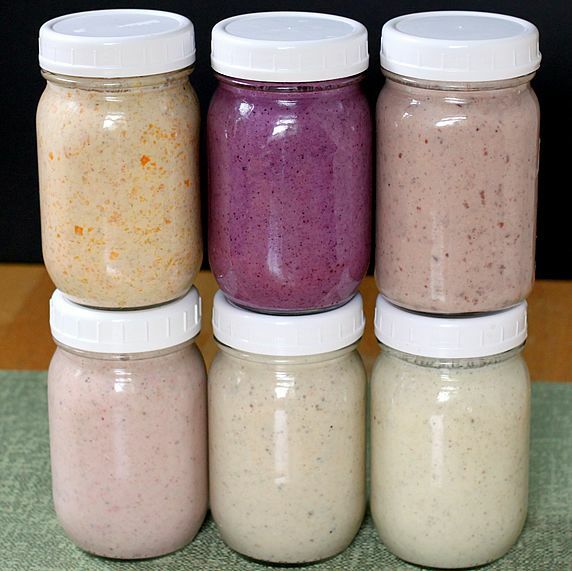 Pint jars are the perfect serving size for storing smoothies in the fridge. 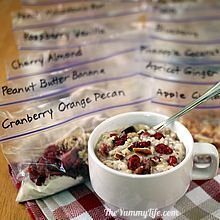 Awhile back, I wrote a post about Overnight Refrigerator Oatmeal that has been very popular with Yummy readers. (Thanks for all of the enthusiastic feedback!) Since then I've been experimenting with a smoothie version of that recipe. In today's post, I'm sharing my 6 favorite flavor varieties along with a formula you can follow for inventing your own smoothie flavor combos. They're easy, can be stored in the fridge for several days; and they can be frozen! Breakfast before school or work, or on the way. 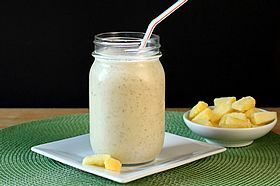 Like the refrigerator oatmeal, these smoothies are easy to grab for a quick breakfast on the go to take along in the car, to work, or anywhere. Smoothies have the added convenience of one-handed drinking--no spoon required--so you can sip on them while you drive or walk. Carry them in a thermos or thermal beverage cup, and they'll stay chilled for hours. They're also very filling; have one for breakfast and they will help you fight the hungries all morning. If you have kids and have a hard time getting a healthy breakfast in them before school, let them choose or create a favorite flavor and help you make them ahead of time. Some of these taste like dessert, yet they are so good for you. There is a lot of hidden nutrition that is masked by the sweet flavor of fruit. Great boost before or after exercise. King-Man has been enjoying sampling the variations of smoothies in this post. He's an exercise nut (really pretty nutty fun, in general), and these smoothies are a perfect post-workout nutrition boost for him. They're also great for him to have on hand at work. Make ahead convenience. Freezable, too! This may be my favorite feature of these smoothies. 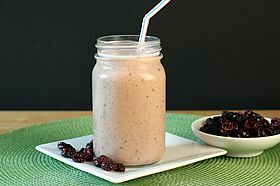 Like my Overnight Refrigerator Oatmeal, you can make these smoothies a day (or two or three) ahead, refrigerate them, and have a healthy breakfast or snack ready to go. Better yet, these freeze well, too. I've been making up a variety of flavors at once, putting some in the fridge and some in the freezer. 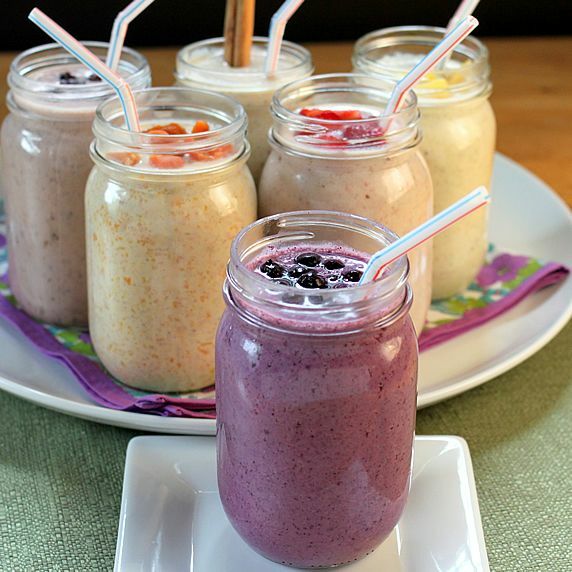 LOVE having a smoothie ready to drink whenever I want one--no time, hassle, or mess. A complete meal in a glass. The combination of oatmeal, chia seeds, yogurt, and fruit makes these well rounded nutrition. Every smoothie will differ some in nutrition according to the exact ingredients used. Here is the nutritional breakdown for one 2-cup serving of my Strawberry Banana Oatmeal Smoothie. The other 5 recipes should be in this ballpark, too. I honestly can't drink a whole 2-cup serving at one time. I've been drinking half of a smoothie for breakfast and having the other half for a mid-morning snack. It keeps me full all morning. 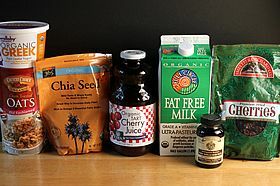 Chia seeds are power food (and a perfect smoothie thickener). If you are unfamiliar with the health benefits of these amazing little seeds, you can read about them in my Refrigerator Oatmeal post. In these smoothies, they have the added benefit of serving as a thickener, since they absorb 10 times their weight in water and become gel-like. Smoothies often use ice cubes or frozen fruit to thicken them, but that means they have to be eaten right away before their ingredients melt. 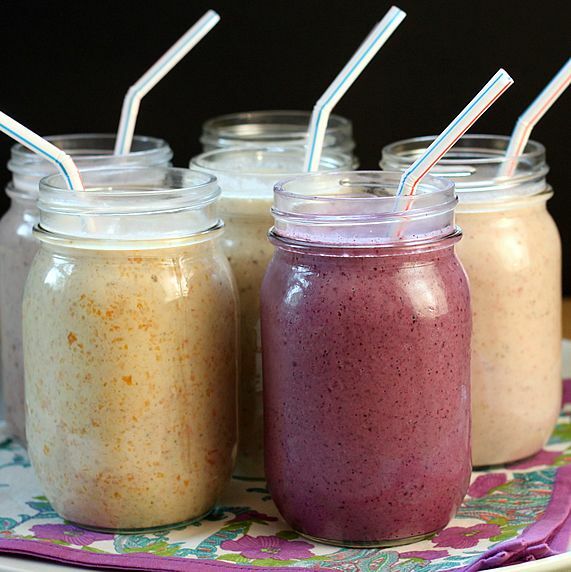 Using the chia seeds as a thickener allows these smoothies to be made far in advance and still have a perfectly thickened consistency whenever you drink one. I used the same procedure for making all 6 smoothies. I'll share those specific recipes and give you my formula so you can create your own if you like. Step 1. Assemble these ingredients and supplies. Oats. I recommend old fashioned rolled oats over instant or quick oats--they're less processed and better for you. But, instant or quick oats will work, if that's what you have on hand. 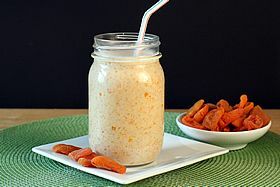 Steel-cut oats aren't recommended for these smoothies, because they don't blend and soften well. Chia seeds. I bought mine at Whole Foods; available on Amazon, click here. 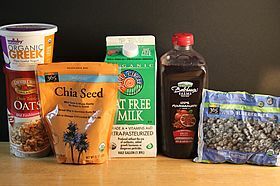 I used whole chia seeds (they blend and soften perfectly in these smoothies); but you can also buy ground chia seeds, if you prefer. Yogurt. You can use any kind of yogurt (including non-dairy yogurts). I prefer low-fat Greek yogurt for it's creamy consistency and high protein; read my post for easy instructions for straining regular yogurt to make Greek yogurt. Milk. 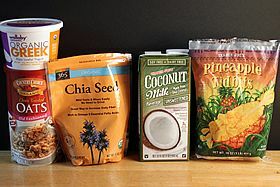 I used skim cow's milk, unsweetened coconut milk, and unsweetened almond milk in these recipes. You can substitute any type of milk you prefer. Fruit juice. This is optional. You can use all milk for the smoothie liquid, or a combination of milk and juice. You'll see in my 6 recipes that I did it both ways. Fruit juices can vary a lot in their flavor, nutrition and sweetness. Blender. They can vary in power and effectiveness. The better blenders produce a smoother consistency. A smoothie blender is particularly convenient, if you have one. They come with multiple containers for blending/storing/drinking. I bought mine on Amazon, click here. Fruit. You can use fruit in any form. I prefer fresh or frozen. Sometimes frozen fruit has better flavor and nutrition, since it's picked and frozen at the peak of ripeness. I used dried fruit in two recipes (cherries and apricots). Delicious! If using dried fruit, use half as much as fresh fruit, and add more liquid since the dried fruit rehydrates and absorbs some liquid as it soaks. Jams, preserves, spreads. These are optional add-ins. They provide both flavor and sweetness. 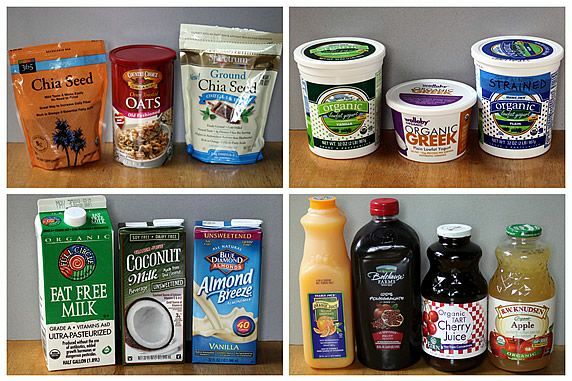 Read the labels to find no or low-sugar options. Fruit sauces, purees, and butters. These can be substituted for fresh or frozen fruit, or used to supplement the flavor. Applesauce is one of my favorites. Sweet spices, extracts, flavors. Also optional add-ins. My favorites: cocoa powder, cinnamon, vanilla bean paste (or extract) and almond extract. Sweeteners. Optional, depending on how sweet you like your smoothies and the sweetness of other ingredients. Some of the fruits and juices may add enough sweetness without additional sweeteners. 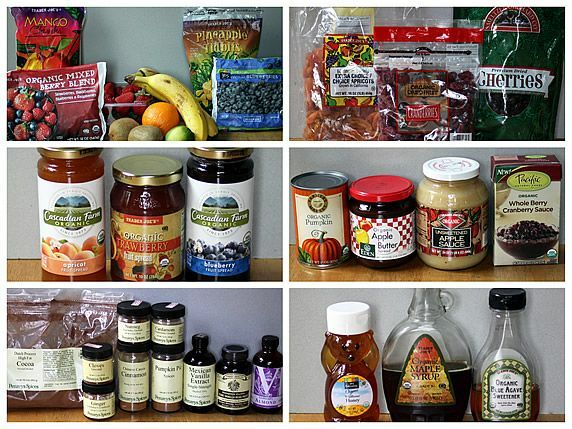 I like the flavor of honey, maple syrup, and agave syrup in smoothies but there are many options. Use whatever suits you. Even sugar isn't all that evil in small quantities--only 15 calories per teaspoon. I recommend first blending all of the other ingredients and tasting the smoothie to see if it needs added sweetener. 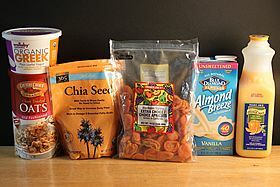 Specific amounts of each ingredient are listed with the recipes of each flavored smoothie; they are further down in this post. Click on the big teal bar below each flavor and that links to the recipe with detailed ingredients and instructions. There's also a printable recipe of the general formula to follow for creating your own flavor combinations. Step 2. 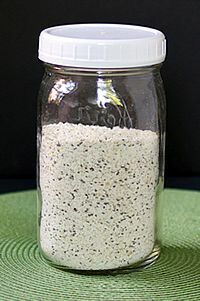 Add oats and chia seeds to blender container. Blend on high until you have the consistency of a flour. (It only takes a few seconds in my blender, but blender power varies so much that I can't tell you exactly how long it will take.) This helps the oats and chias blend into the smoothie without a chucky texture. 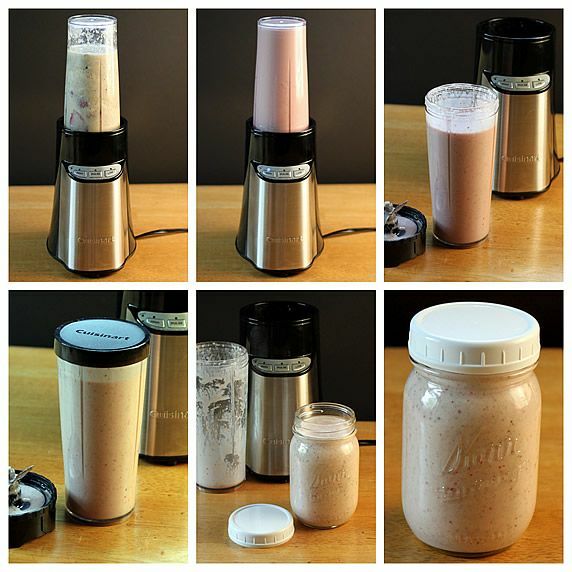 The finer your grind them, the smoother your smoothie will be! 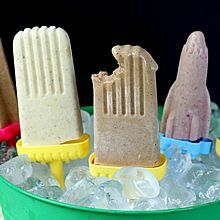 Convenience tip: I use this same oat/chia mixture in my Healthy FroYo Pops. If you'll be making these smoothies or FroYo Pops frequently, it's a time saver to blend a bigger batch of oats and chia seeds ahead of time in a blender or food processor. I make a big batch and store them in a jar. 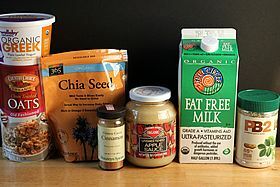 This way it's ready to add a 1/4 cup scoop of this oat/chia flour to a batch of smoothies or FroYo Pops. For a big batch, blend 2-1/4 cups oats with 1/4 cup + 1/2 tablespoon chia seeds. That's enough for about 9 batches of smoothies or froyo pops. 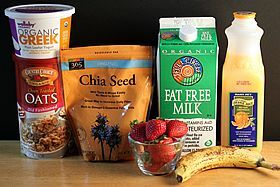 The photos below illustrate mixing the ingredients for a Strawberry Banana Oatmeal Smoothie. Step 3. Add the liquids (milk/juice) to the blender container. It helps to use a long spoon or spatula to mix in the ground oats/chias from the bottom; otherwise they can get stuck and blend in poorly. Step 4. Add the yogurt, fruit, and any spices or additional flavors. Step 5. Blend until ingredients are pulverized and smoothie has a consistency you like. I like mine with some texture; but you can keep blending it until it's smooth if you prefer it that way. If you are using dried fruit, it may not blend as well as fresh fruit. I like it with the texture of some bits of dried fruit. If you want yours smoother,You can rehydrate the fruit first by soaking it in juice, milk, or yogurt before making the smoothie. Or, blend the smoothie again after it has it's overnight fridge soak--the fruit will have softened and should blend in better. Click here for Amazon link to pint (2 cup) jars. Click here for Amazon link to half-pint (1 cup) jars. Click here for Amazon link to white plastic lids for mason jars (fits all regular mouth canning jars). Click here for Amazon link to plastic pint freezer jars. Step 7. 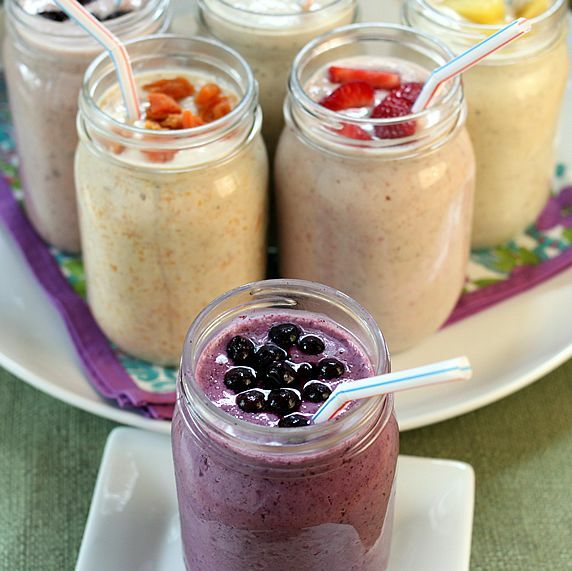 Put the jars or containers of smoothies in the fridge overnight or a minimum of 4 hours. They need this soak time so the oats, chias, & dried fruit (if using) can soften and expand. This gives the smoothie a thicker texture, too. TO FREEZE your smoothies, first put them in the fridge for their soak time (minimum 4 hours); then transfer to the freezer. 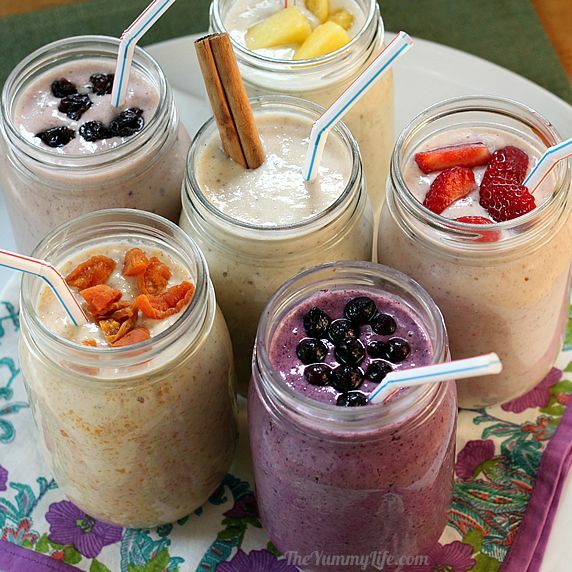 Frozen smoothies can be moved to the fridge a day ahead so they can gradually thaw for drinking the next day. Or, place them in a bowl of cold water on the counter to thaw them the same day; it will take 1-2 hours to thaw this way. TROUBLESHOOTING TIPS. Making smoothies is not an exact science. They can vary in texture and consistency depending on the ingredients you use and the power of your blender. Here are a few things to keep in mind. Thick or thin. Once your smoothie has had its fridge soak time, you can check it to see if it's the consistency you like and make adjustments. Fruits can have different liquid content, and that can affect the consistency of your smoothie. The recipes below give you a starting point for ratios of liquids to the other ingredients. Hopefully they will work for you the first time; however you may need to add a little more liquid if yours turn out too thick, or add more of the non-liquid ingredients if it's too thin. My recipes that use dried fruits already have more liquid built in to allow for the fruits absorbing liquid as they rehydrate. However, even dried fruits can vary in their dryness; so again you may need to do some adjusting. Use a good blender. They can vary widely in power and producing smooth results. Blend the oats and chias to a powder-like flour consistency. The finer their texture, the smoother your drink will be. Don't use dried fruit. In my recipes that use dried fruit, their are visible bits of fruit after blending--it simply doesn't blend as finely as fresh fruit. I like it that way; but if you don't, stick with fresh, frozen, or canned fruit. Blend your smoothie a 2nd time after the fridge soak time. All the ingredients will have softened by then, and it's easier to blend them into a smooth consistency. 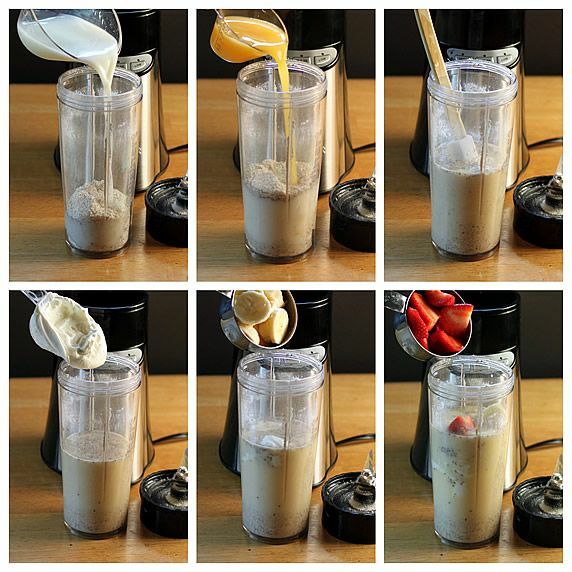 The easiest way to do this is to blend everything the first time, put the covered blender container in the fridge for the soak time, and return it to the blender for a second blending (adding more liquid, if needed). This does add a step, but you can still do most of the measuring, mixing and mess a day (or more) ahead. 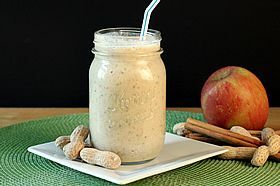 Once you've figured out "your way" of making the perfect oatmeal smoothie, you can make these regularly with ease. King-Man and I are pretty hooked on them. Here are the recipes that have worked for us. Made with dried apricots, orange juice, and unsweetened almond milk. Made with applesauce, cinnamon, and PB2 (or peanut butter). What is PB2? I'm a fan of this amazing powdered peanut butter. It's simply peanut butter with 85% of the fat removed. With all of the flavor and protein of regular peanut butter, PB2 is recommended as a great way to reduce calories in all of your favorite peanut butter recipes. It's available at some Whole Foods and health food stores, and on Amazon, click here. 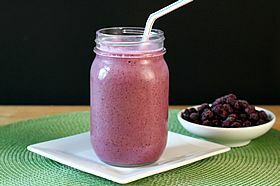 Made with dried cherries, cherry juice, and vanilla bean paste (or you can use vanilla extract). This one tastes like dessert, and cherries are loaded with antioxidants! Made with pineapple and unsweetened coconut milk. Tastes like a pina colada! 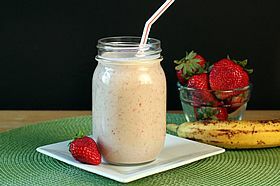 Made with fresh strawberries, bananas and orange juice. King-Man's favorite. Made with pomegranate juice and frozen (or fresh) blueberries. This is loaded with antioxidants. It's always hard to choose a favorite. I think I like the cherry vanilla bean smoothie the best. Today anyway. Get creative and combine your own favorite ingredients for a recipe you can call your own. It's fun and easy when you follow my simple formula. I love the convenience of having these in my fridge and freezer. If you freeze them, be sure to leave at least 1/2" of head space to allow for expansion from freezing. Since you can make these ahead, they're great to serve guests in the morning or take to a breakfast/brunch potluck. You can jazz them up with toppings to help identify their flavor. Hurray for food that looks as inviting as it tastes. And, good for you, too! I'd love for you to leave a comment and share your favorite flavor combo. Choose from one of mine or invent your own. Do you eat vegan? gluten free? lactose free? Please share your adaptations. Your tips are helpful to me and the entire Yummy community.